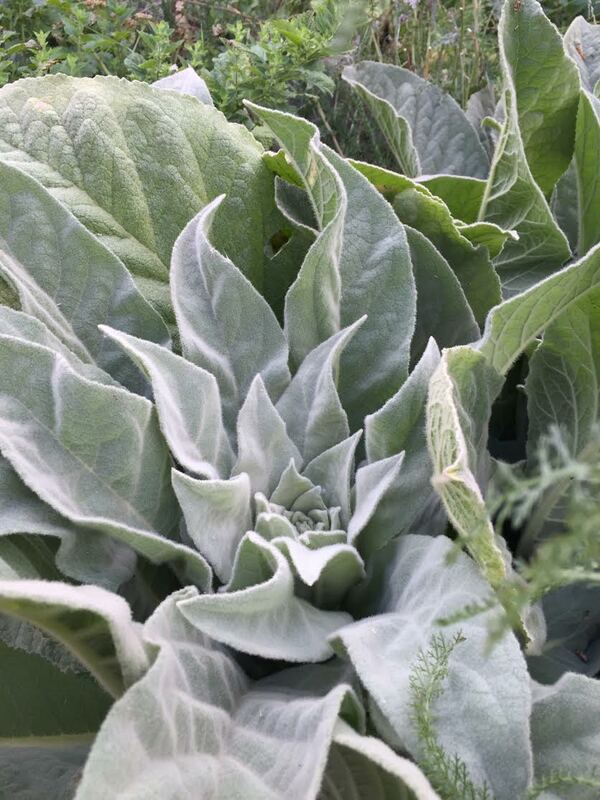 I first met mullein in Arizona a year before we sowed the seeds, which resulted in four healthy plants. 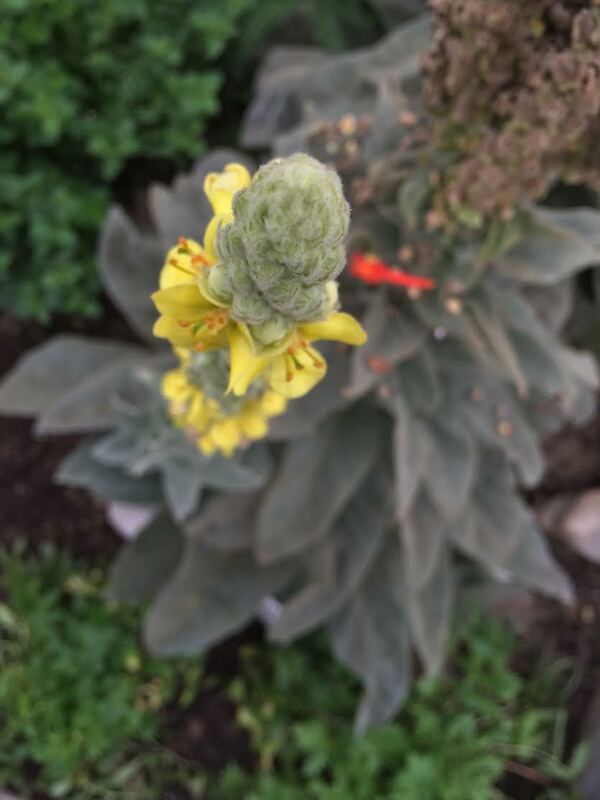 We planted our gathered mullein seed in Fall 2015 and they began to send up their flower stalk in June of this year. I've had the pleasure of using this plant's medicine in various stages since cultivating it. 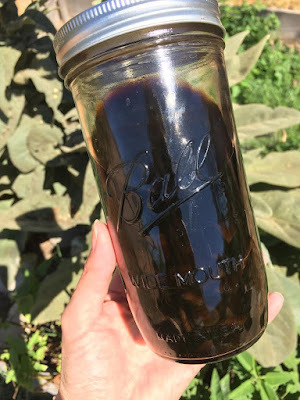 Most recently, I used oil soaked leaves as compresses to move lymphatic congestion in the pelvic area, which worked like a charm! 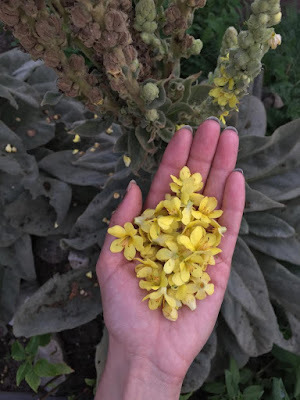 Two other mullein plants already in flower were crowding one that had yet to form a rosette so I harvested my first homegrown mullein roots. I learned about some of the root's medicinal use by reading jim mcdonald's wonderful herbcraft.org website. Jim credits his learning from conversations with Matthew Wood about its use and through the sharing of collective knowledge. It helps support back ailments centered around the spine and like jim says ,"aligns joints”. 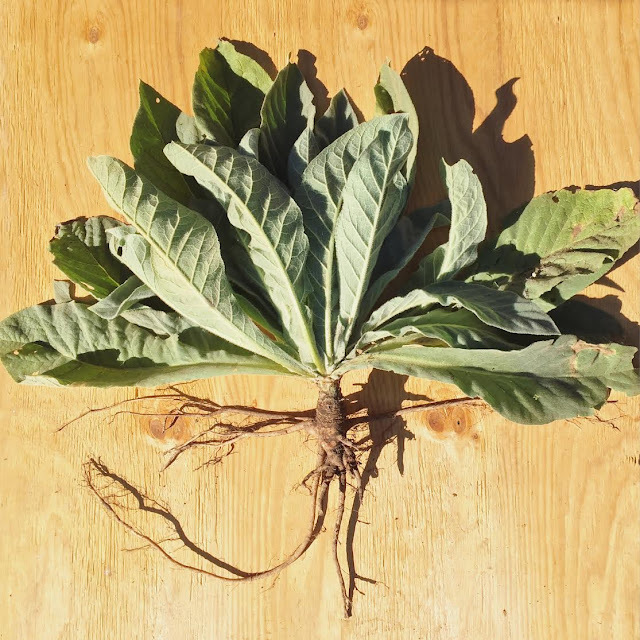 Kyle Denton, herbalist at Tippecanoe Herbs also learned about mullein root from jim and has used it in his practice with much success. Kyle also shares that, “It works amazing for TMJ problems, Bell’s Palsy Paralysis and with nettle root for urinary incontinence.” Thank you so much for sharing Kyle. This weekend I'll be straining out my mullein root tincture to support back/spinal issues. I noticed how dark the tincture turned and rather quickly too. Right away that made me think of this plant's energy and medicine and some of my favorite common names for it, like Hecate's Staff, Hag's Taper, Graveyard Dust, and Old Lady's Flannel. Growing low to the ground as to ready for a sturdy flight into the greater atmosphere, I think displays this plant’s essence perfectly. Balance between what lies below and what lives above. Some say the flower stalk is a torch that guides and protects us through darkness. After letting the bees indulge themselves with the first round of blooms I decided to start gathering a few to add to pain liniments, I’ve used mullein flower brandy tincture for an earache before and it eased the pain so much, which, in turn eased my anxiety. I learned that folk method through collective knowledge so it’s hard to credit one person. Watching this plant grow has probably been the most fascinating of all garden plants so far. The transformation of the rosette that forms and then shoots up towards the sky has been such a blessing to observe and learn from. To date, they keep forming new flowerstalks that huddle around the main one. I've noticed their flowering period really responds to water nourishment, much like the fluids that keep our lower backs and spine happy. 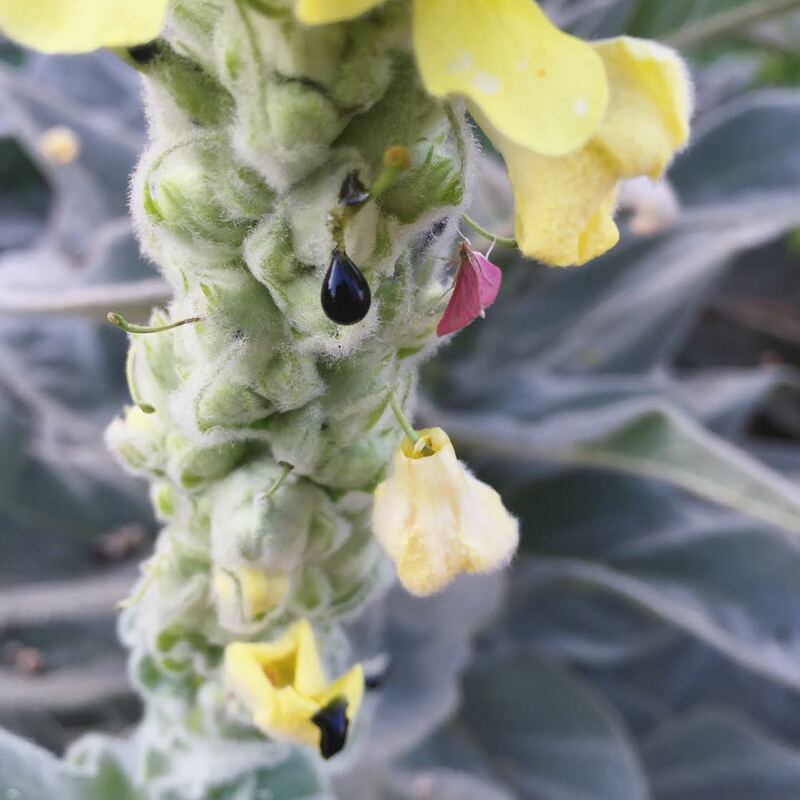 And just when I thought this plant couldn’t get more magickal I observed it crying black tears from flower bud pest piercings, mullein resin! I bravely tasted some and it had a mild earthy and vanilla flavor. According to Kiva Rose’s blog on Mullien this resin may be a "psychotropic ally" when gathered and tinctured. There wasn’t nearly enough to be tinctured to experiment, however, it was super cool to be surprised by and taste. Mullein is serving to be a great addition to our resilient medicinal garden and I look forward to saving seed and letting them go to seed to continue their garden reign, it will be fun to see where they re-seed themselves. Content credits: Jim McDonald, Kyle Denton and Kiva Rose. Links above.